More than 4,000 essential and useful words and phrases in realistic visual contexts, organized within 12 thematic units. (E.g., Everyday Language, Health, Work, and Recreation) Exercises on the page provide immediate practice with, and expansion of, target vocabulary. Story Pages provide multilevel literacy development and critical thinking questions. The interactive version of OPD2e encourages learners to set goals and self-select vocabulary items to learn and practice. The vocabulary notebook, four-skill exercises, games, flash cards and tests help them chart their progress and help instructors identify learning gains. Much more than an e-version of the OPD, the OPD Interactive includes videos, stories, and interviews that recycle the topic vocabulary and provide expanded practice. Writing screens with prompts and links to related OPD topics support learners’ writing skill development. 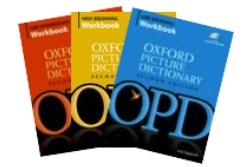 The Oxford Picture Dictionary app provides instant access, anytime and anywhere, to pictures and vocabulary of the OPD2e. 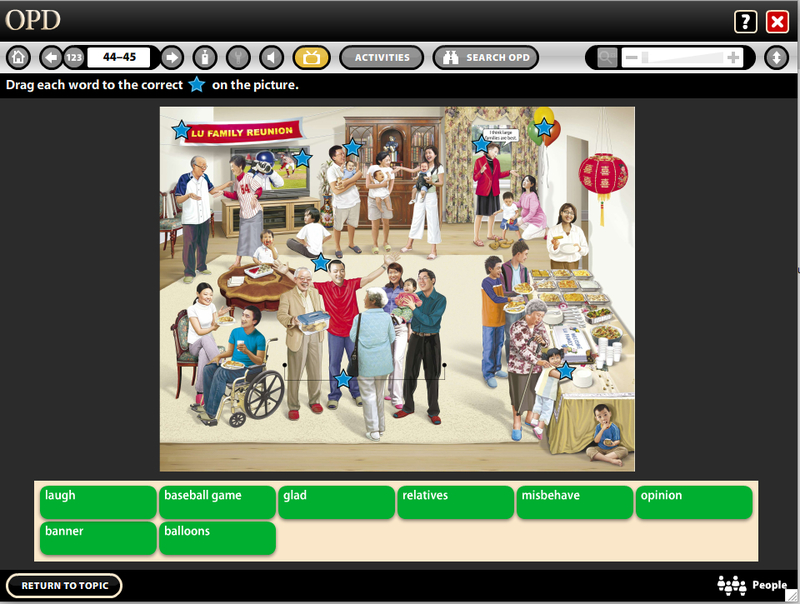 Each of the over 4,000 illustrated terms is supported by bilingual audio in English and Spanish. The app provides students with unlimited independent practice, and the bookmarking and search tools increase learner autonomy. 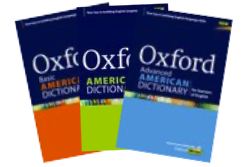 The 13 bilingual editions of the OPD2e: Arabic, Brazilian Portugues, Chinese (Mandarin), Farsi, French, Haitian-Creole, Japanese, Korean, Russian, Spanish (pictured here), Thai, Vietnamese and Urdu, provide instant access to over 4000 essential and useful words and phrases. Ideal for self-directed, active learning and/or multilevel ESOL classrooms. Also an excellent companion for the OPDi interactive or OPD App. The Classroom Presentation Tool allows teachers to present and practice the topics and contextualized vocabulary of the OPD2e using an LCD projection or interactive whiteboard system. 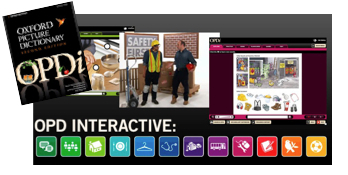 Video and animated segments expand the target vocabulary context, while interactive reinforcement activities such as labeling, sequencing, and focused listening engage all learners. Downloadable art and worksheets for every OPD2e topic make this an extremely valuable teaching resource. 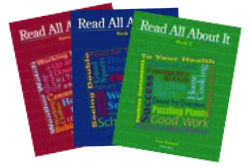 These richly illustrated companion workbooks for the OPD 2e program support learners’ listening, reading and writing skill development while incorporating practice with 4,000 useful and practical words and phrases. This black-line master collection of thematic, interactive, collaborative and cooperative classroom tasks is ideal for multilevel contexts. Tasks such as roundtable labeling, information gaps, and more than 900 reproducible picture cards make this one of the most useful ESOL texts you can have in your library. A resource for Family Literacy, CBET and parent center instructors with lessons and reproducible materials that teach L2 parents’ ways to support their children’s developing literacy and study skills. This slender tome provides the background on evidenced-based vocabulary teaching and shows how to provide direct instruction of vocabulary learning strategies to beginning and low-intermediate ESOL learners. Examples are taken from the OPD 2e. This wonderful resource gets to the heart of what it means to know a word. Dr. Zimmerman delves into teaching strategies that help learners work with meaning, collocations, grammatical features, derivations, register and appropriateness. This basic version of the OPD is specifically designed for pre-literate learners and newcomers who benefit from the reduced word list. (There are 1200 entries in Basic OPD versus 4000 in the OPD2e.) Also available are lesson plans, a page-for-page correlation workbook, a reproducible activity book, picture cards, and a literacy binder. • Transition from picture dictionaries more easily by using words they can understand for definitions and using illustrations for more difficult words. • Learn content area words from math, chemistry, biology, geography, etc. • Focus on the Academic Word List andthe Oxford 3000TM (the most important words to learn in English). This handbook, by vocabulary expert Keith Folse, helps students: learn and practice the most important words to know in the Oxford English 3000TM. It also helps them explore the many ways a dictionary can extend their vocabulary. 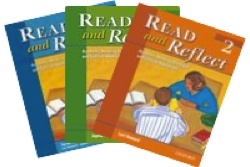 The Read and Reflect series helps students develop their academic reading and thinking skills while they acquire academic vocabulary. Readings are based on a variety of authentic sources and explore US culture as a starting point for meaningful cross-cultural discussions. A five-level ESOL integrated skills course that supports differentiated instruction, and helps learners use English to demonstrate their critical thinking and problem solving skills. The series is standards based, linked to the Oxford Picture Dictionary2e and includes lesson plans by J. Curries, lesson plans, workbooks, interactive CD-roms, and multilevel activity books. 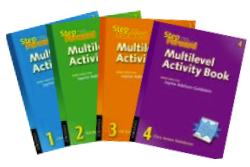 Each book of reproducible materials provides the basis for task-based instruction in the multilevel classroom-each worksheet can be used in three different ways, allowing all learners to get the same material. Differentiation occurs in the approach the material and/or the roles learners take on in the task. 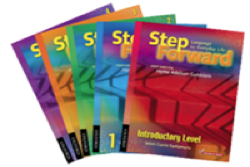 Each book’s worksheet is linked to a lesson in the correlating Step Forward text. Readers can pick and choose which aspects of instructional planning they want to develop in this highly accessible tool for developing communicative, multilevel ESOL lessons. Reflection prompts and simple practice tasks. A four-level grammar series with an online practice component that is discourse based and very accessible. 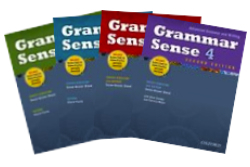 (This is a great tool for ESOL teachers who want to “get a handle” on grammar instruction.) Grammar is presented in context and both accuracy and fluency exercises are part of the program. Be sure to check out the interactive program as well! Inglés Ya! Is a low-level, high-interest, DVD series that provides English language instruction with Spanish bilingual support. This classic teacher-training video series includes theoretical background, lesson materials, practice tasks and authentic classroom demonstrations for 12 essential ESL techniques: Lesson Planning, Total Physical Response, Early Production, Language Experience, Beginning Literacy, Dialogue/ Drill, Information Gap, Focused Listening, Role Play, Problem Solving, Life Skills Reading, and Narrative Reading.